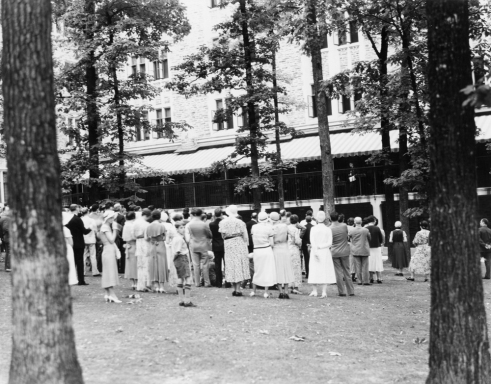 On July 21, 1930, Duke University Hospital opened to patients after three years of construction. The idea for the hospital can be traced back to 1925, when industrialist James B. Duke made a $4 million bequest to establish a medical school, nursing school and hospital to help improve health care in the Carolinas. Duke’s dream was to create what he hoped would become the best medical institution between Baltimore and New Orleans. Although Durham already had two hospitals – Watts and Lincoln – Duke would be unique in offering specialized medical care, and with 400 beds, it would be by far the largest hospital in the city’s history. Some experts were skeptical about the idea of a medical facility of this size in Durham, arguing that the area was not densely populated enough to support it. But patients were willing to travel. On the hospital’s first day, 17 patients were registered. The number continued to grow at an extraordinary rate and, by 1932, over 10,000 patients had been treated. While it began as a regional hospital, today the Duke University Medical Center is recognized as one of top health care organizations in the country, known for its commitment to education, research and innovation. A special thanks to the Duke University Medical Center Archives and Assistant Director Jolie Braun for putting this story together.